I do most of my shooting with my Sony Alpha 900 – it’s a great camera which produces spectacular results, but there are occasions and places where it just isn’t practical to take the Sony. Sometimes it’s the size and at other times I’m in a situation where I just don’t want to risk the Sony. For that reason I also have a little ‘Point n Shoot’ camera, an Olympus µ[mju:] 1030 SW – the bouncy waterproof camera from the TV ad. It goes without saying that the image quality from a ‘Point n Shoot’ isn’t as good as from a digital SLR, but that doesn’t mean that good results can’t be achieved – far from it. The pictures below was taken whilst sailing in the 2007 Three Rivers Race during a quieter moment when I had the chance to get the Olympus out. I love these pictures. The first is what I spend most of my time looking at when sailing. 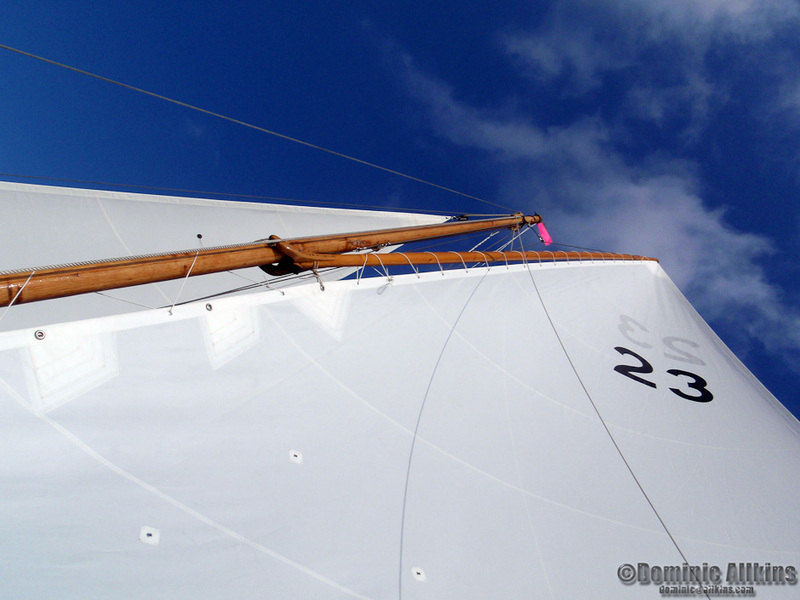 The contrast between the sails and the blue sky is lovely. 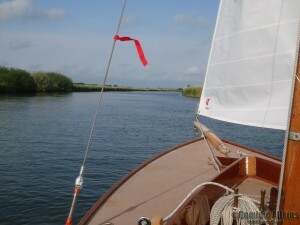 The second and third are looking forward as we make our way up the River Thurne towards Hickling Broad. 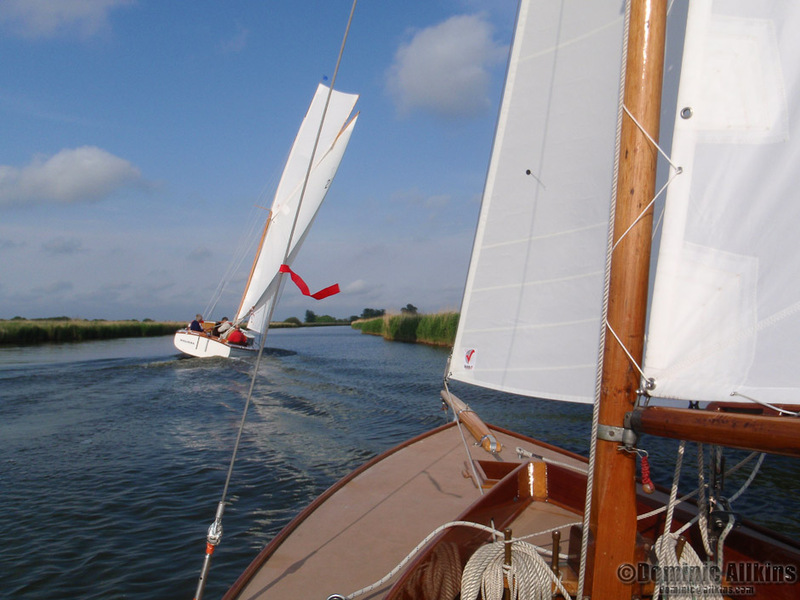 The sailing cruiser that overtook us is a very quick boat which I’ve been fortunate enough to crew several times and after passing us she just disappeared into the distance. What these pictures show (I hope) is that it’s not the camera that makes a good photograph, but the person and the imagination behind the lens. It’s the creative eye that sees the shot – all the camera does is record it to remind us in the future of what it was stirred our emotions enough in the first place to take the picture. Posting these in the winter with the boat out of the water for it annual maintenance makes me yearn for the long, cold, dark months of winter to pass, for spring to arrive and to get back on the water. This entry was posted on Wednesday, July 21st, 2010 at 06:24 and is filed under Blog, Images. You can follow any responses to this entry through the RSS 2.0 feed. You can leave a response, or trackback from your own site. 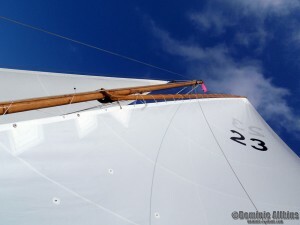 Love the image of the sails and sky.. great colour and composition. It’s one of my favourite pictures. I had it printed 30″x20″ and framed – now hanging in the sitting room. BTW – I’m planning to add my blogroll this evening so will add your learning log to the list – will ping you an email when it’s done. It's one of my favourite pictures. I had it printed 30"x20" and framed – now hanging in the sitting room. BTW – I'm planning to add my blogroll this evening so will add your learning log to the list – will ping you an email when it's done. It's one of my favourite pictures. I had it printed 30″x20″ and framed – now hanging in the sitting room. Totally agree. DSLR’s arguably offer higher detailed images but there have been plenty of times I have been caught without my slr and missing a shot. A good compact and light point and shoot can save the day 😉 . I also like the first shot Dominic, the lines, colour and contrast’s are superb! You’re absolutely right – the compact can save the day.